The Chromebox Commercial from AOPEN is a commercial-grade device designed for powering digital displays and vertical applications across a range of applications, from kiosks and public transport systems to high traffic retail environments. Measuring 25mm high, it is made to fit behind displays and can be integrated into kiosks or POS systems to be hidden from sight. 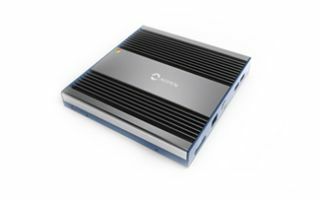 AOPEN’s Commercial Chromebox is a shock and vibration resistant, solid-state device with a wide operating temperature range (up to a maximum of 60°C/140°F). Features like built-in hardware encryption and verified firmware boot help protect against unauthorized breaches. This also broadens the applications of the Chromebox Commercial, making it possible to use in verticals where high volumes of classified data might be collected, such as government or health services. Stephen Borg, global director of strategy and marketing at AOPEN, said the Chromebox has been designed to be ultra-low maintenance, with automatic system updates, auto recovery, and Zero Touch Manageability via the cloud using Chrome Device Management. "The Chromebox Commercial is a true feat of engineering," said Borg. "It offers continuous performance even in the most challenging environments. We’ve designed it so you can just set it up and let it run. Its fanless, vent-free design means there’s no dust building up. You can install it and be confident that the Chromebox is going to continue to power your displays, 24/7." Connected other devices such as POS peripherals, can be done via RS and RJ commercial ports, including for legacy applications.